Purpose: To identify signifying changes in a pharmacy curricular revision. Methods: A cross-sectional study basing on two pharmacy curricula from a curricular revision was undertaken. Differences in credits, study tracks, course areas, course contents and learning outcome (LO) standard domains between the previous and current curricula were examined. Percentages of specific LOs, a fraction of the total available LOs present in both curricula were calculated by course areas and LO standards. Results: No changes were found in credits, study tracks, course areas, or LO standard domains. Changes in course contents were observable but were unmeasurable. Percentages of specific LOs varying widely between the two curricula were significantly different in several course areas and LO standards indicating their adaptable changes. Conclusion: Percentages of specific LOs were signifying changes in this pharmacy curricular revision. The specific LOs that were measurable, adaptable and associative with course areas and standards could be applied as means guiding to the development process of curricular revision. Internationally, the Accreditation Council for Pharmacy Education Standards 2016 (ACPE Standards 2016)16 established educational outcomes for a professional degree program in pharmacy that pharmacy educators could use when designing their pharmacy curriculum. The ACPE Standards 2016 framework covered four major standards and a total of fifteen key elements: Standard 1 Foundational Knowledge with one key element, Standard 2 Essentials for Practice and Care with four key elements, Standard 3 Approach to Practice and Care with six key elements, and Standard 4 Personal and Professional Development with four key elements. Similarly, particularly in Thailand, the development and design of pharmacy curricula in universities under the Commission of Higher Education of Thailand (CHE) had to comply with the Thailand Qualifications Framework for Higher Education 2009 (TQF). 17 The TQF includes six standards. Each standard was comprised of sets of skills and knowledge, forming sub-standards and graduate attributes. Students were to attain these attributes through the teaching and learning in their respective discipline. These attributes are referred to as learning outcomes (LOs). The six TQF standards are comprised of a total of twenty-three key LOs. These were namely Standard 1 Morality and Ethics with three key LOs, Standard 2 Knowledge with five key LOs, Standard 3 Cognitive Skills with five key LOs, Standard 4 Relationship and Responsibility Skills with three key LOs, Standard 5 Skills at Numerical Analysis, Communication and Information Technology Use with four key LOs, and finally Standard 6 Professional Skills with three key LOs. Moreover, these broad six TQF standards and their sub-standards are subject to interpretation, which allows room for curriculum design teams from each discipline or faculty to select LOs based on the requirements of their discipline. One of the most significant issues of the TQF is the description of learning and LO standards. Learning means behavioral changes in the learners, which the learners developed on their own after finishing the study. LO standards refer to the specifications of LOs that learners would have acquired from studying. Thus, the six TQF standards and their key LOs selected by curriculum design teams were set as curricular objectives for designing the courses. The six TQF standards and key LOs also formed the required elements of curriculum mapping. Curriculum mapping is very important because it provides a framework for the implementation and evaluation of the TQF standards in a curriculum.18 Evaluating and updating curriculum continuously was essential, and there were several strategies19, 20 to do so. Curriculum mapping was one of those necessary strategies. Curriculum mapping can be considered a tool for developing and scheduling faculty members,21 evaluating LOs,22,23 standardizing course curricula,24 and scheduling courses.25 Though these actions could lead to improvement of separate courses, a curricular revision process was still necessary to align all of the curricula. 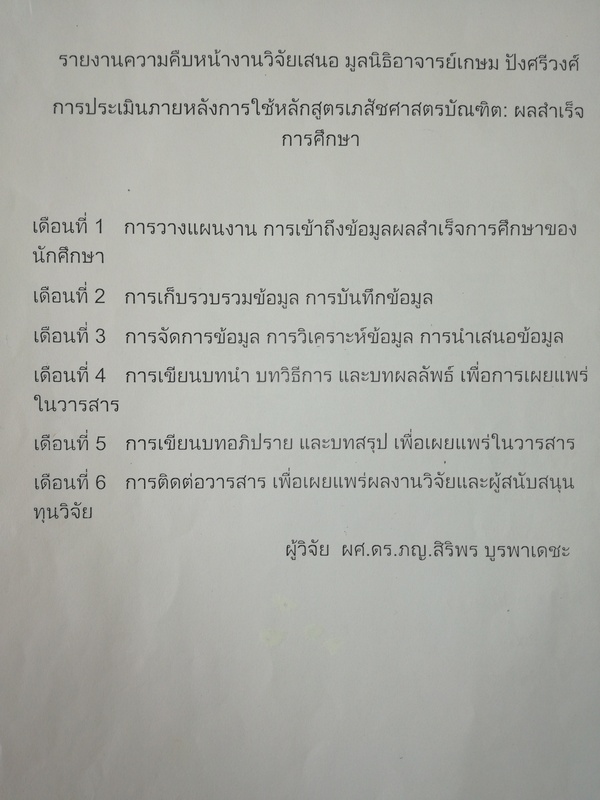 In Thailand, pharmacy curricula must be revised at least every six years as required by the CHE. 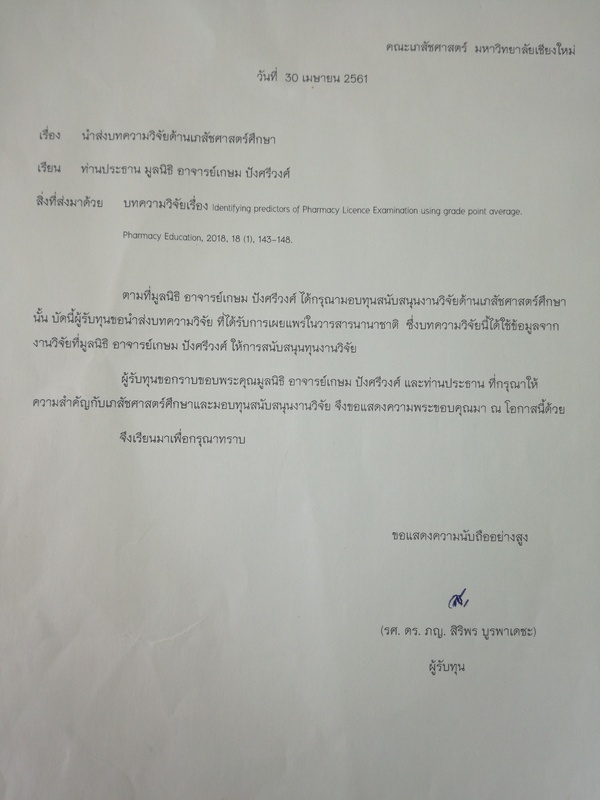 Another important agency, the Pharmacy Council of Thailand, set the similar requirement in congruence with the CHE. 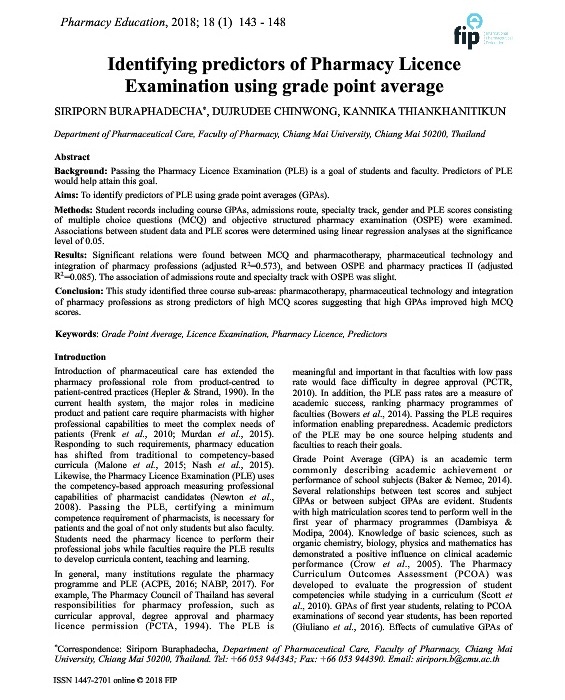 Hence, the Pharmacy Curriculum 2010 of a university in Thailand, the subject of the investigation of this paper, was initially developed and implemented during the academic years of 2010. 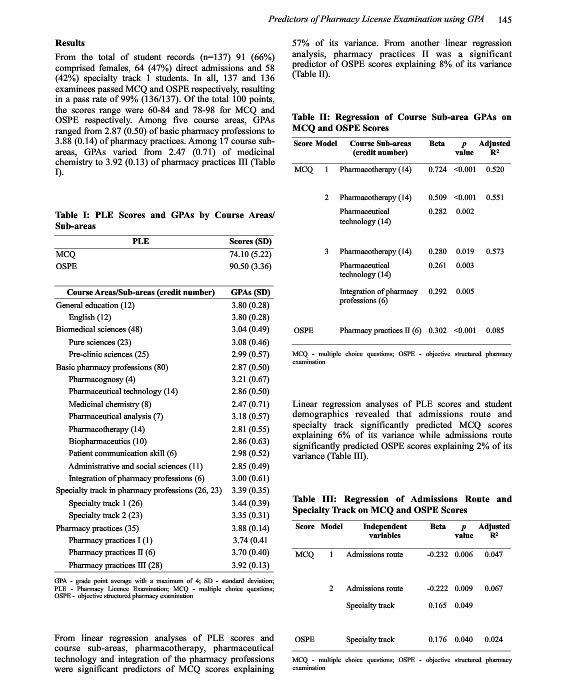 The curriculum was revised, resulting in the Pharmacy Curriculum 2013. Developing changes after this revision were expected, but no measures to express the degree and direction of them were established. The purpose of this study was to identify signifying changes that could be observed and applied to measure the development of curricular revision. 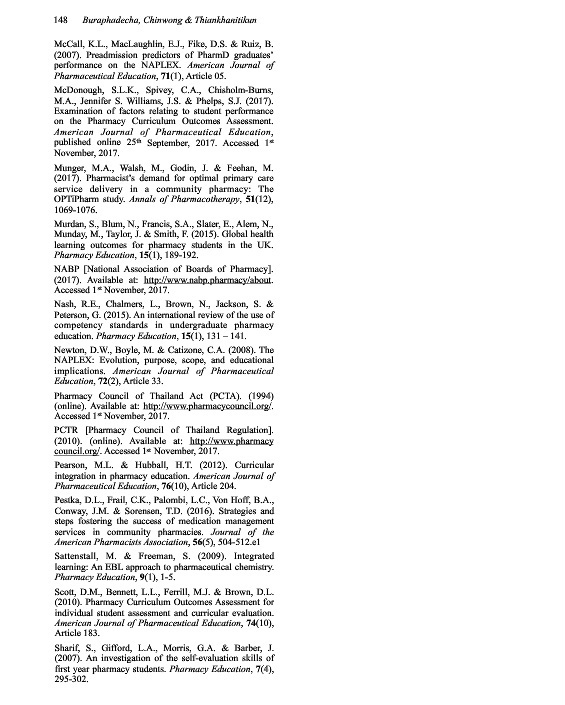 This study examined two 6-year pharmacy curricula: the Pharmacy Curriculum 2010 (previous curriculum) and the Pharmacy Curriculum 2013 (current curriculum). Data extracted from careful reading and understanding of the curricular structure provided that the two curricula contained two tracks of specialization: Track 1 focused on drug products and Track 2 addressed patient care. Students were to choose one of these two tracks in year 4 of their program. Students were required to study these course areas namely (1) general education (courses in English, humanity and social sciences), (2) pure sciences and biomedical sciences, (3) general pharmacy profession for all pharmacy students (courses in pharmaceutical, clinical, social/behavioral/administrative sciences and clerkship), (4) tracked specialization in pharmacy profession (courses in drug products or patient care) and (5) free electives. These course areas were examined for their contents and credits. One important part of a curriculum was the curriculum mapping of all courses. Each course contained six standards and their twenty-three key LOs, called available LOs. According to course objectives, instructors selected one or more standard and further specified one or more key LO (specific LOs) for their courses. Each specific LO was illustrated as a black dot meaning that students would learn, practice and test proficiency. The rest of available LOs might be taught and practiced, but not evaluated. They were designated on the curriculum map as white dots. This investigation examined only the specific LOs that required the evaluation of students’ abilities and competence. The number of specific LOs and available LOs of each course were totaled for a certain course area or a particular standard, then a percentage of specific LOs was determined. This percentage was a proportion of specific LOs to its available LOs. Data performed with SPSS 17.0 were analyzed by descriptive statistics. The changes in the percentages of credits and specific LOs were examined by the two-sample-z-test for the differences between two proportions at the statistical significance level of 0.05. Changes were made in course contents of general pharmacy profession and specialization in the pharmacy profession. The changes involved adding new courses, moving courses from one area to another, decreasing credits, increasing credits, and deleting courses (Table 1). The number of courses with changed contents could be determined but their content could be not. Total credits of previous and current curricula were 231 and 233 credits, respectively. The percentages of course credits were similar indicating no significant changes between them (Table 2). Regarding the course areas, the percentages of specific LOs varied widely in tracks and curricula. Averages of these percentages for each track and curriculum were demonstrated. Significant differences were observed in percentages of specific LOs between the tracks and the curricula (Table 3). Regarding the standards, the percentages of specific LOs ranged widely in tracks and curricula. Averages of these percentages for each track and curriculum were shown. Several significant differences in the percentages of specific LOs were found between tracks and curricula (Table 4). Inability to determine contents limits its use to observe the curricular development. Moreover, changes in contents (pharmaceutical, clinic and social/behavioral/administrative sciences) involve scientific and professional literature concerning only the knowledge standard and neglecting the other standards. Thus, changes in course contents are difficult and unsuitable for demonstrating curricular development during revision. Instead, specific LOs engaging all course areas and standards are easier and more suitable for measuring development. However, significant reductions in specific LOs from the previous curricula to the current curricula for several course areas and competency standards demonstrate that focusing on revision as a mandated process alone is not sufficient. There must be a framework to measure growth and improvement in curricular design. The number of course credits is controlled by the CHE and the Pharmacy Council. Compared to course credits, the number of specific LOs could vary depending on instructor preference and curriculum requirements. As a result, using specific LOs is applicable to frame direction and quantity of curricular development. In general, the standards for LOs are described in the pharmacy curriculum, but their totals are not mentioned. That is, the standard LOs were used as the descriptions of the learning and teaching objectives. For instance, as stated in the pharmacy curriculum, the students are expected to gain knowledge of pharmacy at the end of their study. However, assessing the level of proficiency the students had attained was difficult. A curriculum that utilizes specific LOs could require specific levels of proficiency in the form of percentages to measure learning. For example, a pharmacy curriculum needs Standard 3: Cognitive Skills for student’s excellence. Every pharmacy profession course is required to contain the specific LOs of this standard at the level of at least 80%. With specific goals for proficiency, instructors will be challenged to teach at a higher level, resulting in higher student achievement. However, the other standards must not be neglected so the minimum percentage of standards should be taken into account. This application will be useful for shaping the curriculum, especially when revising it. Moreover, the percentages of specific LOs can be beneficial in both establishing a baseline and developing specific growth targets. As usual, curricular revision deals with changes in course contents and credits so that the basis of curriculum before revision is difficult to define or to initiate. Setting the percentage of specific LOs in the previous curriculum as a benchmark, new goals can be established for improving the percentage of specific LOs in the updated curriculum. For example, when on average the previous curriculum contained 65% of the specific LOs, the new one may set it at 75%. The specific LOs are then distributed to suitable courses. Applying the amount of specific LOs could provide a clearer extent of development. In addition to using specific LOs as a benchmark for curriculum mapping, specific LOs can also be used to measure the strengths and weaknesses of a course or program. This will help prioritize course areas in need of improvement. Determining strengths and weaknesses of a course without an objective measure is difficult. The specific LOs can serve as an objective measure of strength or weakness in a curricular area. If students routinely score lower in proficiency for a specific LO or if it is determined that a specific LO is not represented in the curriculum at a sufficient level, examination of the curriculum and instruction in that course area can drive improvement efforts. Instructors are also an important part of curricular revision because of their decisions to identify specific LOs. Most instructors are often concerned with the specific LOs of their courses and rarely aware of those of other courses. When the percentages of specific LOs have not been shared, discussed, and compared across the courses, they may be overlooked resulting in lower percentages. Administrators can collect and communicate curriculum data, so instructors recognize the importance of specific LOs and participate in curricular assessment28 with a broader perspective. To implement the specific LOs, instructors must teach, provide practice opportunities, and assess proficiency. The third one seems difficult to achieve. For example, key learning outcome 16 reads “skills in human relations and cooperative skills, i.e., having good working relationships with other professionals and the ability to adapt when working with others”. Instructors may feel unconfident in observing and measuring this skill, so they may avoid specifying it in their curriculum. By examining the curricular data, administrators can identify specific LOs that instructors may be avoiding. This gives the administrator an opportunity to provide professional development in teaching and assessment. He or she can work with instructors to clarify meaning and discuss alternative methods of evaluation. The percentages of specific LOs can signify changes in this curricular revision because they are measurable, adaptable and associative with course areas and standards. Thus they could be applied as means guiding to the development of curricular revision. Focusing on the revision of course contents is limited. In contrast, using specific LOs as a quantitative expression across all course areas and standards is objective and measurable. As the study demonstrated, without specific objective guidance for curricular development, revisions are subjective and could easily miss the mark. Monitoring the use and proficiency of specific LOs enabled instructors and administrators to prioritize and target key course areas and standards in need of improvement. This application of specific LOs provides means of creating a framework for development process of curricular revision. The authors are grateful to Doctor Kasem Pangsrivongse Foundation for funding this study. Founded in 2016, this non-profit foundation aims to provide financial supports for the activities leading to the advancement of pharmacy profession including research in pharmacy education. 1.Hepler CD, Strand LM. Opportunities and responsibilities in pharmaceutical care. Am J Hosp Pharm. 1990; 47 (3): 533-543. 2.Reta A, Dashtaei A, Lim S, Nguyen T, Bholat MA. Opportunities to improve clinical outcomes and challenges to implementing clinical pharmacists into health care teams. Prim Care. 2012; 39 (4): 615-626. 3.Farrell B, Ward N, Dore N, Russell G, Geneau R, Evans S. Working in interprofessional primary health care teams: What do pharmacists do? Res Soc Adm Pharm. 2013; 9 (3): 288-301. 4.Jacobi J. Clinical pharmacists: Practitioners who are essential member of your clinical care team. Rev Med Clin Condes. 2016; 27 (5): 571-577. 5.Miller GE. The assessment of clinical skills/competency/performance. Acad Med. 1990; 65 (suppl 9): S63-S67. 6.McClelland DC. Testing on competence rather than intelligence. Am Psychol. 1973; 28 (1): 1-14. 7.Eraut M. Concepts of competence. J Interprof Care. 1998; 12 (2): 127-139. 8.Delamare Le Deist F, Winterton J. What is competence? Hum Resource Dev Int. 2005; 8 (1): 27-46. 9.International Pharmaceutical Federation (FIP). A global competency framework for services provided by pharmacy workforce. The Hague, The Netherlands. Available from: 〈https:// www.fip.org/files/fip/PharmacyEducation/GbCF_v1.pdf〉; 2012. Accessed November 11, 2016. 10.Competency Development and Evaluation Group (CoDEG). GLF3/4 General level framework for pharmacist development in general pharmacy practice. London. Available from: 〈http://www.codeg.org/fileadmin/codeg/pdf/glf/GLF_Octo ber_2007_Edition.pdf〉; 2007. Accessed November 11, 2016. 11.Pharmaceutical Society of Australia (PSA). National competency standards framework for pharmacists in Australia. Available from: 〈https://www.psa.org.au/download/standards/competency-s tandards-complete.pdf〉; 2010. Accessed November 11, 2016. 12.Pharmacy Council of New Zealand. Competence standards for the pharmacy profession. Available from: 〈http://www.pharmacycouncil.org.nz/cms_show_download.php?id=201〉; 2011. Accessed November 11, 2016. 13.Pharmaceutical Society of Ireland (PSI). Core competency framework for pharmacists. 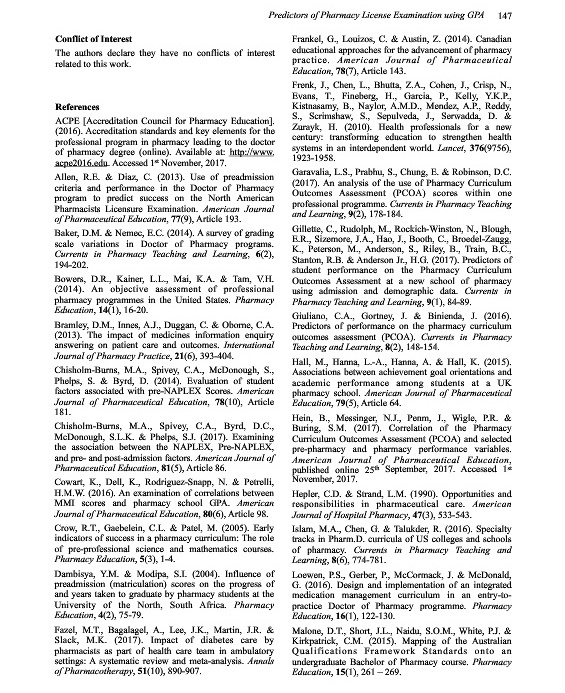 Available from: 〈http://www.thepsi.ie/Libraries/Publications/PSI_Core_Competency_Frame work_for_Pharmacists.sflb.ashx〉; 2013. Accessed November 11, 2016. 14.Murdan S, Blum N, Francis SA, Slater E, Alem N, Munday M, Taylor J, Smith F. Global health learning outcomes for pharmacy students in the UK. Pharm Educ. 2015; 15 (1): 189-192. 15.Malone DT, Short JL, Naidu S, White PJ, Kirkpatrick CM. Mapping of the Australian qualifications framework standards onto an undergraduate bachelor of pharmacy course. Pharm Educ. 2015; 15 (1): 261-269. 16.Accreditation Council for Pharmacy Education Standards. Available from: 〈http://www.acpe-accredit.org/pharmd-program-accreditation/〉; 2015. Accessed March 9, 2017. 17.Thailand Quality Framework of Higher Education B.E. 2552. Office of Higher Education Commission, Ministry of Education. 2552. Available from: 〈http:www.mua.go.th/users/tqf-hed/〉; 2009. Accessed November 11, 2016. 18.Spencer D, Riddle M, Knewstubb B. Curriculum mapping to embed graduate capabilities. High Educ Res Dev. 2012; 31 (2): 217-231. 19.Janke KK, Tofade T. Making a curriculum commitment to continuing professional development in doctor of pharmacy programs. Am J Pharm Educ. 2015; 79 (8): Article 112. 20.arlowe KF, Wargo KA, Kelley KW. Peer review of the curriculum as a continuous process of improvement. Curr Pharm Teach Learn. 2012; 4 (3): 157-164. 21.Uchiyama KP, Radin JL. Curriculum mapping in higher education: A vehicle for collaboration. Innovative Higher Ed. 2009; 33 (4): 271-280. 22.James D, Hartzler ML, Chen AMH. Assessment of critical thinking skills progression in a pre-pharmacy curriculum. Curr Pharm Teach Learn. 2016; 8 (6): 767-773. 23.Gleason BL, Gaebelein CJ, Grice GR. 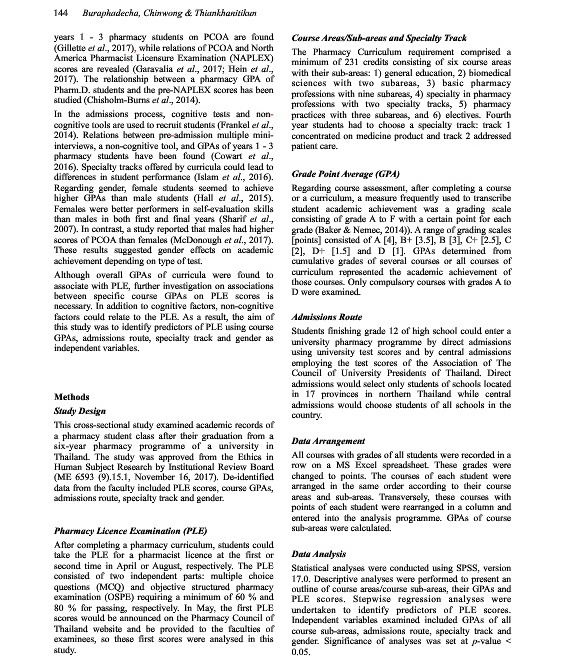 Assessment of students’ critical thinking and problem-solving abilities across a 6-year doctor of pharmacy program. Am J Pharm Educ. 2013; 77 (8): Article 166. 24.Lam BH, Tsui KT. Curriculum mapping as deliberation-examining the alignment of subject LOs and course curricula. Stud High Educ. 2016; 41 (8): 1371-1388. 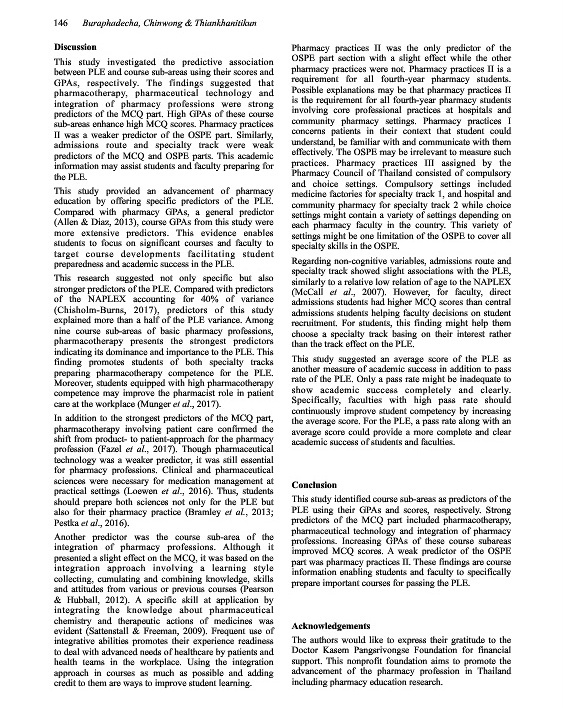 25.Sato E. Design of spiral curriculum for pharmacy students to reach the outcome. Yakuga Zasshi. 2015; 135 (3): 345-347. 26.Cone C, Bond R, Pierson J. Teaching critical thinking and problem-solving in pharmacy self-care lab: A skills-based approach. Curr Pharm Teach Learn. 2013; 5 (5): 342-350. 27.Peeters MJ, Boddu SHS. Assessing development in critical thinking: One institution’s experience. Curr Pharm Teach Learn. 2016; 8 (3): 271-278. 28.Zelenitsky S, Vercaigne L, Davies NM, Davis C, Renaud R, Kristjanson C. Using curriculum mapping to engage faculty members in the analysis of a pharmacy program. Am J Pharm Educ. 2014; 78 (7): Article 139.